In the 1830s and 40s, Britain experienced cycles of economic growth and decline over a wide range of industries — not least the burgeoning railway industry that served them. The years 1836 and 1837, during which Parliament authorised 59 new lines, have been called the 'minor' Railway Mania, and they brought Stephenson plenty of work. With several high-profile railways in operation, including the Stockton & Darlington and Liverpool & Manchester lines plus many more newly authorised, the ever-active Stephenson was at his most industrious. He was involved in route planning for the Birmingham & Derby Junction, Manchester & Leeds, Maryport & Carlisle, North Midland and York & North Midland railways, among others. Biographer Samuel Smiles (1812-1904) notes that in the three years ending in 1837, Stephenson and his assistant travelled "by post-chaise alone upwards of twenty thousand miles" (32,180km). No doubt they covered yet more ground on foot, making surveys and supervising works. Stephenson's assistant was often Frederick Swanwick (1810-85), who completed the horse-powered Whitby & Pickering Railway (opened 1836) on Stephenson's behalf and went on to engineer the North Midland Railway (1840). 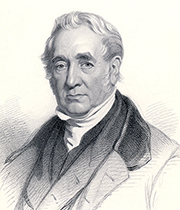 George's son Robert Stephenson (1803-59) was also taking on more work, steadily earning a reputation for technical excellence. In 1836, George Stephenson & Son was set up, and they opened a London office at 9 Duke Street, Westminster. This office quickly proved too small and in February 1837, they moved, first to 35/36 Great George Street and then to 24 Great George Street off Westminster Square. This would remain the centre of their operations until Robert's death in 1859. Between 1839 and 1913, the Institution of Civil Engineers (founded 2nd January 1818) occupied "the adjoining mansion" at 24-26 Great George Street (now at 1-7 Great George Street) — although George did not apply for membership. In 1837, King Leopold invited the Stephensons back to Belgium for the opening of the rail line from Brussels to Ghent. They were celebrities in Belgium. In the same year, Robert took over from his father as engineer to the Birmingham & Derby Junction Railway for the construction phase. The line would open on 12th August 1839. On 4th July 1837, the Grand Junction Railway opened, linking Birmingham to Liverpool. Stephenson and Joseph Locke (1805-60) had been in an uneasy alliance as its joint engineers until Stephenson had withdrawn some two years earlier. On 12th July, the Maryport & Carlisle Railway obtained its authorising Act of Parliament. During construction of the 116km North Midland Railway from Derby to Leeds, tunnelling revealed rich reserves of coal in the Clay Cross area south of Chesterfield, Derbyshire. Just as at Snibston, Stephenson saw the commercial potential here for sinking pits and transporting coal by rail, in this case to London and the Midlands. He formed George Stephenson & Company (later known as the Clay Cross Company) to capitalise on the opportunity by leasing land for collieries. His partners were Joseph Sandars (1774-1857), Joshua Walmsley (1794-1871, knighted 1840), George Carr Glyn (1797-1873, later Baron Wolverton), George Hudson (c1800-71), William Jackson (1805-76, later Baronet), Samuel Morton Peto (1809-89, later Baronet), Charles Binns (1813-87, Stephenson’s secretary and Walmsley’s son-in-law) and Edward Ladd Betts (1815-72). In 1839, the hazards of Victorian working conditions were underlined by an unfortunate accident at Robert Stephenson & Co.'s Forth Street works, resulting in the death of Stephenson's brother-in-law Stephen Liddle (1794-1839), who was married to his sister Eleanor (Nelly). Apparently he died from a wound in the arm. Stephenson would provide for Eleanor until her death in 1847, and for her surviving daughter Margaret Liddle (1825-52) thereafter. From 25th March 1838, Stephenson rented Tapton House near Chesterfield in Derbyshire, from George Yeldham Wilkinson (1810-88). The 10-year agreement specified an annual rent of £280 for the furnished house and lands but, as he preferred to take the house unfurnished, moving in had to wait until the contents were sold. The Stephensons took up residence in mid-August 1838, moving from Leicestershire. George didn't forget his roots, taking an active interest in local mechanics' institutes, and he was elected a vice-president of the British Association's mechanical science section at its Newcastle meeting in August. Having established Clay Cross Colliery and lime kilns at Ambergate, north of Derby, in 1840 Stephenson began construction of a 3.2km supply railway from the limestone quarries at Crich Cliff to the nearby Cromford Canal. It used rope haulage on two steep inclines (gradients of up to 1 in 5) and steam locomotives elsewhere. In 1841, he acquired mineral rights over estates "in the townships of Tapton, Brimington, and Newbold". Railway share prices took a downturn at the end of the 1830s and beginning of the 1840s, marking the end of the 'minor' period of railway mania. However, by the close of 1842, the economy was in recovery. Railways promoted in the 1830s were reaching completion, rail traffic was increasing and share dividends were rising. By 1843, the 'great' Railway Mania was in full swing. Astonishingly, Parliament received petitions for more than 800 new schemes, and between January 1843 and August 1845 railway shares doubled in value. Speculation increased too, because prospective investors were permitted to pay for shares by instalment, requiring only a small deposit. The appetite for rail transport resulted in many more proposals than could ever feasibly be built. For Stephenson, this period included the completion of a number of railways, including the York & North Midland, which connected with the Leeds & Selby in 1839 and the North Midland in 1840. The Manchester & Leeds line opened between Manchester and Littleborough on 4th July 1839, and from Normanton to Hebden Bridge on 5th October 1840. The link section, from Hebden Bridge to Walsden, opened on 1st January 1841 on completion of Summit Tunnel. The Maryport & Carlisle Railway opened from Maryport to Arkleby on 15th July 1840 (extended 1841). George Stephenson was now in his sixties. The boards of most lines with which he was associated gave him free lifetime passes as a mark of respect. Thomas Summerside's recollections (1878) record, "Mr. Stephenson always travelled without a ticket, such was the honour conferred upon him as Father of the Railways". He loved to find someone interesting to talk to on the journey, and was equally content to ride in a first class carriage or a coal wagon. His politics followed no particular party line, though his work ethic led him to favour the interests of the general public over those of the landed gentry, especially in railway planning. He was a benevolent employer in comparison with others at the time. However, he didn't allow trades union membership at Clay Cross. On the other hand, he condemned the practice of paying workers in tokens that could only be redeemed in shops owned or preferred by colliery owners. Writing from Clay Cross on 14th June 1841 in a letter concerning a commission set up to examine the use of child labour in mines and factories, he commented that "I wish to add my most decided objection to the system of butties [middlemen] so much despised in this county and I also believe connected with them is the tommy shops [colliery shops] which are so injurious to the men. Our men work in small companies of three and four and are paid every fortnight in cash at the office". The child labour commission had been established by Anthony Ashley Cooper (1801-85, later 7th Earl of Shaftesbury). Stephenson's contribution was forthright. He wrote: "I wish to state I do not consider it desirable to employ children under twelve or thirteen years of age [in coal mines]". After five years of renting Tapton House, Stephenson now acquired a lease to it, with mineral rights, beginning 25th May 1843. Over the coming years, he brought order to its extensive grounds, enjoying horticulture and, with his wife Elizabeth, beekeeping. On 4th July 1844, the Chester & Holyhead Railway was authorised by Parliament. He had surveyed the line in 1838, and had acted as consultant to the railway company, but by the end of 1844 his involvement was at an end. Robert was appointed chief engineer and went on to design the line's famous tubular bridges. After 25 years of happy marriage, Elizabeth died on 3rd August 1845 at Tapton House. She was Stephenson's second wife, and she is buried at Holy Trinity Church, Chesterfield, Derbyshire. Soon afterwards, in September 1845, Stephenson and Walmsley sailed to France and travelled overland to Spain to examine the proposed route of the Royal North of Spain Railway. However, the line would have to cross the Sierra de Guadarrama, necessitating difficult tunnelling through mountains. With insufficient projected traffic to make the railway viable, he advised against the project. Perhaps weakened by travel or grief, Stephenson suffered an attack of pleurisy on the journey home from Spain. He would spend his remaining years in retirement at Tapton House. 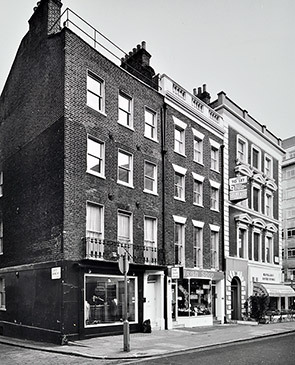 In 1836, George Stephenson & Son was set up, and the company opened a London office at 9 Duke Street, Westminster — the corner building in the photograph (taken 1975).